Mt Te Maunga can be climbed by ascending the ridge behind the hut. A large clearing on the summit promises views on a clear day. Crossing to Sutherland Hut is possible. Taunui Hut • By OldGoat. 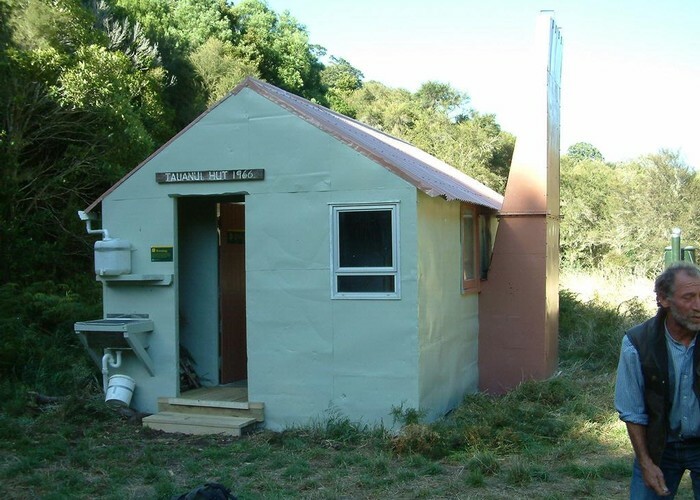 Licence: C.
Sutherlands Hut: 10km (5.5-11hrs). Tough ridgeline route requiring map + compass + good navigational skill. Climb 600m to Te Maunga, then follow ridgeline SW, S to forks 1km downriver of Sutherland Hut. Climb is scrubby for 200m, but otherwise good. 3 points on ridgeline where ridge down off summits is not visible from summit and good navigational skills required. Last 100m to river steep & loose. Added 21 June 2011 by iangeorgeiangeorge. 2 revisions, most recently 20 February 2012 by madpommadpom. 233 views in the past year (19 per month).